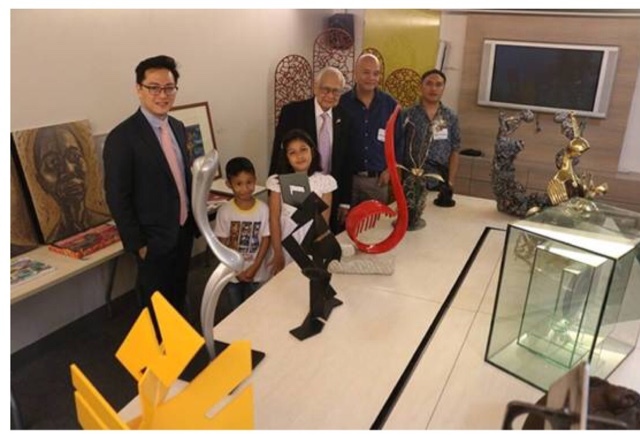 The Rotary Club of Makati West (RCMW) is again holding its annual Alay Sining, an exhibit and sale of the works of the country’s leading and up-and-coming artists to benefit the treatment of indigent children afflicted with congenital heart disease (CHD). ART WITH A HEART. Art can save lives and this has been proven by the Rotary Club of Makati West (RCMW) as it launches its annual charity art sale on November 11-13, 2016 at The Gallery, Greenbelt 5 in Makati City. Now going on its ninth year, Alay Sining is run under the auspices of the Gift of Life International which arranges funding for the treatment of children with congenital heart ailments. It has brought aid to over 18,000 children of indigent families in 71 emerging countries. Alay Sining is a noteworthy example of partnership between the artists who have supported the drive, and RCMW that has successfully benefited children and help them lead normal lives. Among the artists whose works will be on exhibit and sale in this year’s Alay Sining 9 are Abel Agubang, Jinggoy Buensuceso, Glenn Kagandahan, Kenneth Cobonpue, Jojit Nagamos, Jaime Nepomuceno and other leading and up-and-coming artists. Two of Alay Sining’s beneficiares, Maranathalie Balitaon and Rogin de Pedro (2nd and 3rd from left), grace the art exhibit sale launch with Alay Sining president Paolo Delgado, RCMW past president Lou del Rosario, and participating artists Nepomuceno and Sam Penaso. Estimates report that about 5.5 million children all over the world are stricken with CHD, with about 94 percent of them coming from families who can least afford the appropriate medical regimen. Themed “Art with A Heart,” RCMW’s charity drive is now on its 9th year and is run under the auspices of the Gift of Life International (GOLI), an organization that arranges funding for the treatment of children with CHD. In the Philippines, the GOLI charities are spearheaded by the RCMW. Through their tireless efforts, these children continue to receive the heart treatment and surgery for free. Alay Sining 9 exhibit will be held at The Gallery, Greenbelt 5, Makati City on November 11-13, 2016. For inquiries please call RCMW at 753-3098 and look for Kai.